Windows 10 Fall Creators Update has a nifty security feature which perhaps hasn’t been trumpeted by Microsoft as much as it should: namely anti-ransomware defenses. In a blog post detailing how the Fall Creators Update is being deployed in a phased rollout (as all these big upgrades are), Microsoft mentioned that it had hardened security and added protection against ransomware. Specifically, the main countermeasure is a ‘controlled folder access’ feature which is activated in the Windows Defender Security Center app in Windows 10, in the Virus & Threat Protection section, as the Register reports. It’s a simple slider to turn the feature on, and then specified protected folders are locked down, with only authorized apps able to make changes to the files within these folders. By default, common folders where user data is stored (like the Documents, Pictures, and Videos folders) are protected by the controlled folder access system, but you can manually add whichever folders you want to be defended against malware. Remember, you’ll need to have upgraded to the Fall Creators Update to get this feature, and not everyone will have been offered it yet (if you can’t wait to get beefed up security, you can always check out our guide on how to download and install the update right now). And indeed a third-party has tested the new anti-ransomware feature against Locky, and it successfully thwarted the attack. So it sounds promising from the off. 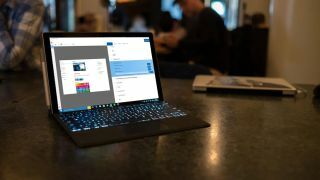 In its post detailing the Fall Creators Update deployment process, Microsoft also noted that it had tested the update with more Windows 10 devices in advance this time around, which should theoretically mean a smoother (and perhaps faster) rollout. That said, we have already seen some issues, although that’s not uncommon with an upgrade of this size and scope (if you’ve encountered any gremlins, we’ve got another guide on how to fix common problems with the Fall Creators Update). The download size of the update is also smaller to the tune of 25%, Microsoft notes, because of the use of ‘differential downloads’ (at least if you grab the upgrade via Windows Update).